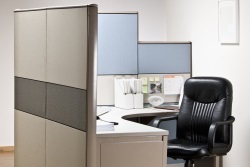 Santa Fe Office Interiors in Overland Park, Kansas provides new and pre-owned office furniture for your home business, commercial office or industrial space. Looking to upgrade that old furniture or make your office stand out to attract clients and employees? The inventory at our 9,000 sq.ft. showroom is constantly changing to provide greater Kansas City businesses a place to find a variety of furniture and fixtures for interior office spaces. Our vast and always rotating selection ranges from desks to book cases, from workstations to conference tables and beyond. But it’s not just about a single desk or object to fill space. Office design is not simply finding a desk and chairs to match. Design and function play an integral role in the day-to-day operations of any business and can directly affect productivity within the workplace. Being a successful business should not mean sacrificing comfort for you or your employees during the 40+ hour work week. At Santa Fe Office Interiors, we provide a variety of options for ergonomic office furniture from industry leaders to match any interior theme or aesthetic. Since 2005, Santa Fe Office Interiors has served quality furniture and interior solutions to commercial, residential and industrial spaces throughout Kansas City. As owner operator with over thirty years in the industry, Jim Lust continues to work with his team to provide affordable, traditional and alternative furnishing options to local businesses large and small. Our clients range from anchor businesses in the community in search of a new look to startup companies eager to get their office space up and business running. As a local, family owned furniture and interior supply business, our expert team has outfitted office spaces throughout the greater Kansas City metro area for over a decade. Looking for interior upgrades or new furniture for your business or commercial space? Our inventory is constantly changing and our showroom is being updated daily! Visit our Showroom today! For every type of work space, whether your Kansas City business is looking to design private office space, cubicles, open working spaces, remote spaces or coworking spaces, our inventory is ready to outfit your needs. 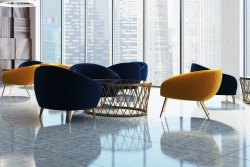 How you furnish and plan the interior workspace can greatly affect the level of productivity, morale, and the bottom dollar of your business which is why we work with the following brands to insure consistent and high quality products. When talking about workplace design, we know that one size does not fit all. Nor does one chair design work for everyone. 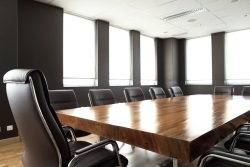 At Santa Fe Office Interiors, we pride ourselves on our inventory as a whole, as well as the ability to offer over 50 types of chairs to suit your needs and the interior office needs of every business in the Kansas Metro area. Creating a safe, comfortable and productive environment through interior furnishings not only saves businesses money, it also promotes a condition to minimize potential health risks as well as reducing body strain and fatigue. Privacy, collaboration, an access to quiet spaces has shown to enhance satisfaction as well as productivity among employees. To accomplish a positive workplace experience as well as a visually pleasing and functioning space, people’s abilities and limitations are factors in workplace design in order to create a productive environment where people enjoy working. Are you ready to get your next interior office project started? Contact our team at Santa Fe Office Interiors at 913-901-8800 and talk with Jim or one of our experienced industry experts. We are here to answer your questions and discuss everything from lead times to delivery and pricing. Prefer to come to our shop? Visit us and our inventory at our Overland Park showroom. The showroom is located at 8106 Santa Fe Drive, Overland Park, KS 66204 and we are open Monday through Friday from 10:00am to 4:00pm. If those times do not work for you or you want to be sure you are meeting with someone specific, you can also make an appointment to stop by whenever it is convenient for you and your schedule. Our inventory changes constantly! New pieces of quality used and sample furniture arrives daily, visit our showroom today!